Make postcard marketing for your cause a snap! 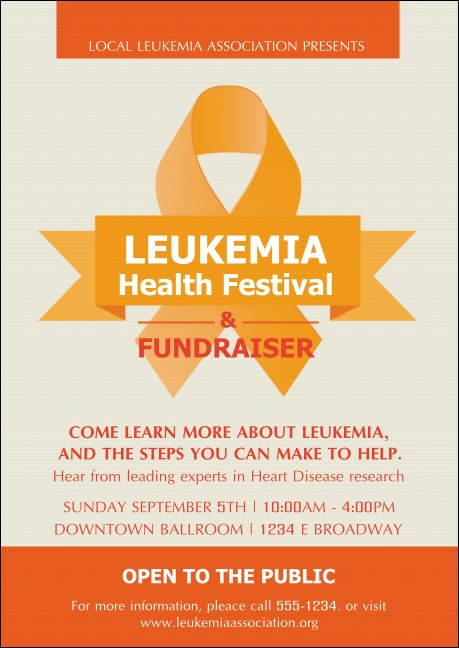 Choose the Leukemia Postcard Mailer, add your fundraising event’s details, and we’ll print and send out via USPS First-Class Mail! When this modern orange and grey design lands in mailboxes, it’ll get noticed straight away, as will the thirteen lines of details about your gathering. Begin tailoring to your needs by clicking on the customize tab above. Postcard’s dimensions approximate: 4.25" x 6"
Draw a crowd to your fundraiser—promote it in advance with postcard mailers from TicketPrinting.com.